It’s important to understand short-circuit current ratings (SCCR) for industrial control panels. Industrial control panel is a general term that describes an assembly of two or more components that can be power, control or both, but doesn’t include the controlled equipment. UL 508A, the UL Standard for Safety for Industrial Control Panels and the National Electrical Code (NEC®) require industrial control panels that contain power circuit components (supply main line power to loads such as motors, heating, lighting, appliances or receptacles) to be marked with an SCCR, previously referred to as awithstand rating. As referenced in UL 508A and the NEC, industrial control panels that contain only control circuit components do not have to be marked with an SCCR. For clarification, this would be an assembly that just controls the performance and does not carry any main line power. However, if the industrial control panel contains the branch-circuit overcurrent protective device (considered a power circuit component) supplying the control circuit, then the SCCR must be marked based on the interrupting rating of the overcurrent protective device. The SCCR represents the highest short-circuit (fault) current that equipment such as industrial control panels can safely withstand without causing a fire or shock hazard. Exceeding the SCCR can cause catastrophic and violent equipment component and enclosure failure. Therefore, it’s important to identify (calculate) the maximum fault current that can be present where the industrial control panel or other equipment is installed and assure the maximum fault current is less than the marked SCCR of the industrial control panel to comply with code. 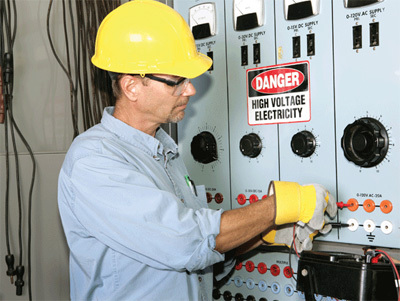 Note that there is not necessarily a relationship between applying an assembly within its marked SCCR and low arc-flash hazard from an electrical safe work practices standpoint. Product standards are used to determine the SCCR for components, such as contactors and motor starters (industrial control equipment); variable-frequency drives (power conversion equipment); terminal blocks or power distribution blocks; and switches. For industrial control equipment, the standard is UL 508; for power conversion equipment, the standard is UL 508C; for terminal blocks, the standard is UL 1059; for power distribution blocks, the standard is UL 1953; and for switches, the standards are UL 508 (motor controllers) or UL 98 (branch circuit disconnects). The SCCR often is dependent on a specific type of overcurrent device. For overcurrent devices, the associated rating is called the interrupting rating, or the maximum fault current an overcurrent device can clear safely. The interrupting rating is determined in accordance with UL 489 for circuit breakers and UL 248 for fuses. For assemblies, the SCCR can be determined by the testing and listing process in accordance with the product standard. For instance, panelboards are tested and listed in accordance with UL 67; switchboards in accordance with UL 891; and motor control centers in accordance with UL 845. For industrial control panels, two alternatives are available to determine an assembly SCCR: testing or analysis method. UL 508A, Supplement SB identifies an approved process that can be used to determine the SCCR for industrial control panels by analyzing the components in the industrial control panel. If desired as an alternative, testing of industrial control panels can be performed to determine the SCCR of industrial control panels. However, this often is cost prohibitive unless large usage of the same industrial control panel is expected. For heating and cooling systems (HVAC equipment), UL 1995, the UL Standard for Safety for Heating and Cooling Equipment, recently was updated to require HVAC equipment to be marked with an SCCR, effective July 2012. This can be determined by testing or by analysis in accordance with the requirements added to UL 1995 which are similar to that of UL 508A, Supplement SB. 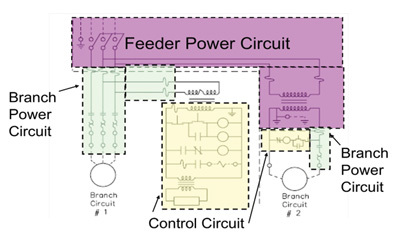 B. Current-limiting devices in the feeder circuit. 1. Find the lowest rated SCCR of any power circuit component. 2. Increase the rating of branch circuit components if possible by using a current-limiting device in the feeder circuit if present. 3. Compare this value to the lowest interrupting rating of overcurrent protective devices in the industrial control panel. The lowest component SCCR (after steps 1 and 2) or the lowest interrupting rating of overcurrent protective devices (step 3) results in the overall assembly SCCR. For power circuit components, the SCCR is determined by either the product markings or the instruction sheets. If there are no product markings, a default value can be used as indicated in UL 508A, Supplement SB (see figure 1). Figure 1. The SCCR is determined by either the product markings or the instruction sheets. If there are no product markings, a default value can be used as indicated in UL 508A, Supplement SB. This chart shows the SCCR of power circuit components for power distribution blocks. In addition, the SCCR for motor controllers can be determined by UL 508. Many manufacturers publish the SCCR for their motor controllers on the UL website. It’s possible to raise the ratings of branch power circuit components — those on the load side of the branch-circuit overcurrent device (the overcurrent device closest to the load). Any component or overcurrent device on the line side of the branch-circuit overcurrent device is in the feeder circuit. 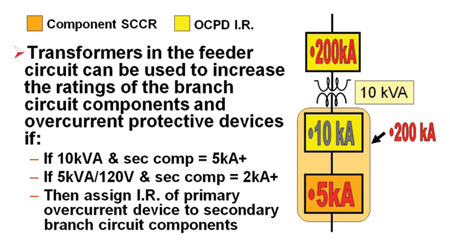 When a current-limiting device (fuse or circuit breaker marked current-limiting or a transformer 10 kVA or less) is located in the feeder circuit, it can be investigated to determine if it can raise branch circuit component ratings (see figure 2). However, branch-circuit overcurrent device interrupting rating can’t be raised by a current-limiting feeder overcurrent protective device. Figure 2. 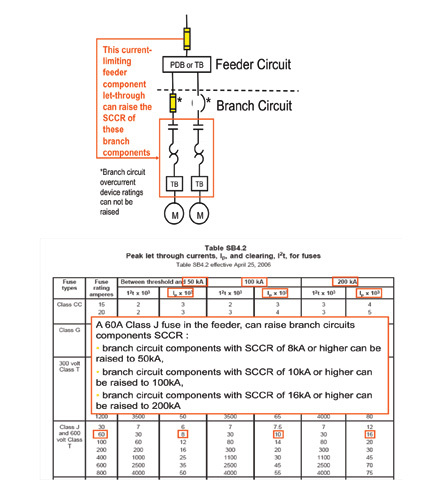 When a current limiting device is located in the feeder circuit, it can be investigated to determine if it can raise branch circuit component ratings. If the peak let-through value for current-limiting fuses in the feeder circuit (at a given fault current of 50 kA, 100 kA or 200 kA) as indicated in UL 508A, Table SB 4.2 (taken from UL 248) is less than the branch circuit component SCCR, then the branch circuit component SCCR can be raised to that value (50 kA, 100 kA or 200 kA) (see figure 3). Figure 3. This illustrates a current-limiting fuse in the feeder circuit that can be used to increase a branch circuit component SCCR, if the peak let-through of the current-limiting fuse from Table SB 4.2 in the feeder circuit at a given fault current level is less than the branch circuit component SCCR. However, the interrupting rating of the branch-circuit overcurrent protective device can’t be raised. If the transformer is 10 kVA or less for transformers in the feeder circuit, as long as the load-side components and overcurrent protective devices are rated 5 kA or greater, the interrupting rating of the overcurrent protective device on the line side of the transformer can be applied to the load-side components and overcurrent protective devices. If the transformer is rated 5 kVA or less with a 120 V maximum secondary, as long as the load-side components and overcurrent protective device ratings are rated 2 kA or greater, the interrupting rating of the overcurrent protective device on the line side of the transformer can be applied to the load-side components and overcurrent protective devices (see figure 4). Figure 4. Transformers in the feeder circuit can be used to raise the transformer secondary components and overcurrent protective device ratings. The final check is verifying the lowest interrupting rating of the overcurrent devices in the industrial control panel. If this is lower than any power circuit component after the steps above, the assembly SCCR is lowered to this value. Three basic changes have been made to the latest edition of UL 508A, Supplement SB dated February 4, 2010. First, the termmotor controllerin the default SCCR Table SB 4.1 has been clarified to indicate that it also includes combination motor controllers, float and pressure operated motor controllers, power conversion equipment and solid-state motor controllers. Second, intermediate peak let-through values at fault currents of 100 kA for Class J and T fuses were added to Table SB 4.2. This allows peak let-through values other than the typical case size of 30 A, 60 A, 100 A, 200 A, etc., to be used at fault values of 100 kA. Intermediate values at 50 kA or 200 kA aren’t available. The third change was clarification of SCCRs vs. interrupting rating in UL 508A Supplement, SB 4.3.2 and 4.3.3. This revision changed the term short-circuit current rating to interrupting rating when referring to overcurrent protective devices. This helps to clarify that current-limiting fuses or current-limiting circuit breakers can’t be used to raise the interrupting rating of branch-circuit overcurrent protective devices. Several more proposed changes to UL 508A Supplement SB are in the preliminary review stage. SCCRs are required to be marked on industrial control panels and other equipment in accordance with the product standards and theNEC. The SCCR for components typically is determined by testing. The process for determining the SCCR of industrial control panels typically is determined by UL 508A, Supplement SB, because testing can be cost prohibitive in low volume applications. The process for UL 508A, Supplement SB analyzes the SCCR for power circuit components, determines if these ratings can be raised by current-limiting devices in the feeder circuit, and compares the lowest component rating with the lowest interrupting rating of overcurrent devices to determine the assembly SCCR. For more information on industrial control panels and SCCR, see Section 4 of the Cooper Bussmann “Selecting Protective Devices” handbook. Download it for free by clicking on the “register for free download link” and submitting the required information at http://bit.ly/SPDhandbook. Dan Neeser is a field application engineer with Eaton’s Bussmann Business. He had been employed by this company since 1996 and specializes in training on the design and application of overcurrent protective devices in electrical distribution systems in accordance with the National Electrical Code®, and equipment in accordance with the various product standards. He participates in IEEE (Sr Member) with Industrial and Commercial Power Systems, NEMA, NFPA (committee member for NEC CMP-13 and NFPA 79), UL (508, 508A, and 508C) and IAEI activities.